At Razzy’s Road House, we are a family friendly restaurant and pub. Our large menu has choices for everyone, including your hungriest family members and a great kids menu for your young ones too! We have 8 plasma TV’s so you can catch the game from any seat in the house. And you’ll love Razzy’s large private room for your next gathering or meeting! 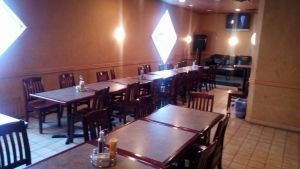 It has ample seating, 2 TV’s and sound system, and a couch, and you can choose from a sit-down catered meal or a variety of appetizers and dishes from our menu. So grab the family and come on over to our HOUSE and feel right at HOME!